Heating - Carey Plumbing & Heating, Inc.
After 75 years in business, we can do it all. Furnace installs, Boilers, Mini Split Systems, Gas Log Fireplaces and more. We have you covered when it comes to home heating. At Carey Plumbing & Heating, Inc., we specialize in keeping our customers comfortable. That means we do everything from regular heating equipment check-ups to emergency service to recommending and installing new equipment. If you have any heating questions or problems, you can count on our trained service team for prompt answers and service. We work with several companies that provide quality products. The reason we work with so many companies is that this gives us the ability to find the perfect unit for your home size and needs. We give free estimates too. Give us a call. We would be happy to answer any questions you may have. Don’t forget, regular maintenance can help extend the life and performance of your existing equipment. 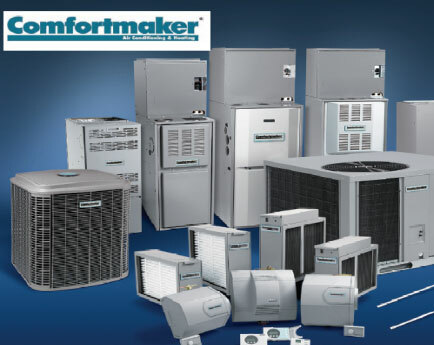 Heating and cooling systems in your home of business are an investment. The best way to ensure the longevity of your equipment is by taking care of it. Regular maintenance can help extend the life and performance of your existing equipment. Are there any hot or cold areas? Check gas /oil connections, gas valve operation and gas pressure if needed. Check and clean pilot and burners & test for peak efficiency. Make sure the burners light smoothly. Adjust burner air shutters if needed. Check electrical connections. As needed, measure motor current. Check system controls and safety circuits for proper operation. Check the temperature rise (operational performance) to ensure that it’s within the limits listed by the manufacturer. Inspect the vent system/flue piping for proper operation. Check the heat exchanger for cracks, corrosion, or sooting. Lubricate blower motor if applicable. Carbon Monoxide test. This is done on all systems. Check thermostat settings – review with Home Owner. We are your Mid-Michigan Area Boiler Specialists. Benefits of Boiler Heating Systems. Boiler heating systems work by heating water and circulating it through radiators or in-floor radiant tubing placed in living spaces. Some systems heat the water until it turns to steam while others use only hot water. Heat from the steam or water radiates out into the living space as the steam or water cools. The water is then circulated back to the boiler through a return pipe where it is reheated. Boilers are nice because they distribute heat evenly throughout your home. Because boilers don’t use blowers they are much quieter than your average furnace and, dust does not get blown around inside your home. Boilers can also be easily customized with zoning systems. When your home is broken into zones for heating, it is easy to save money on heating because you can keep little used areas of your home cooler than the rest of the home. With the use of programmable thermostats, you can save even more and program the heat to be low while you are at work and come up to a comfortable temperature just before you are scheduled to arrive home. Furnaces are usually cheaper to install than boilers, although the equipment cost of each is determined by many factors, including energy efficiency. A high efficiency condensing furnace can cost more than a slightly less efficient boiler. Radiant heat systems run almost silently. Forced-air systems are relatively noisy. 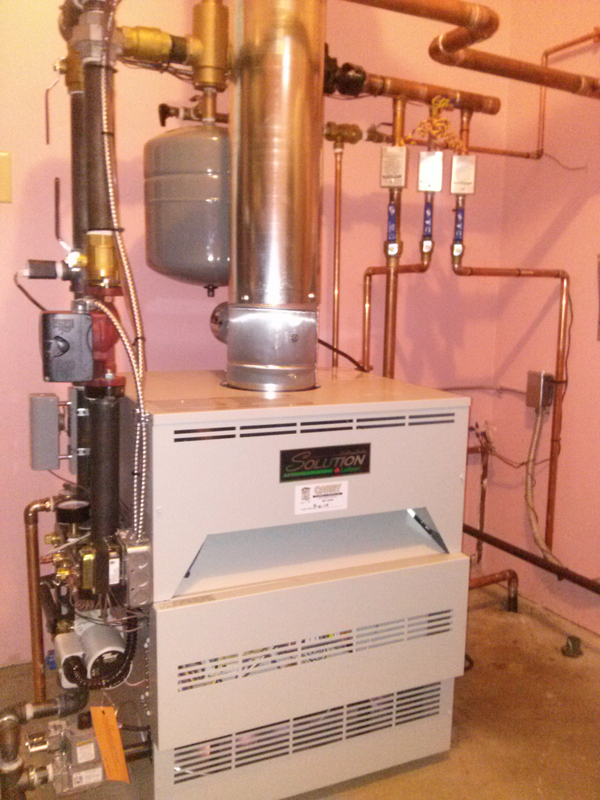 Boiler systems are easier to maintain than furnace systems. There are no filters to change and no ducts to clean. You don’t need to worry about things like blocking vents with furniture or keeping doors between rooms open to allow adequate airflow. Hot water systems are extremely reliable and last for many years, but if they ever have leaks they can cause a lot more damage to your home’s structure and furnishings than a leaking forced-air duct can. Radiant systems provide better indoor air quality than forced air systems. There is no air blowing dust and allergens around with a boiler. Boilers do not dry the air out in winter like a forced-air system does. There is no danger of freezing with a forced-air system. With a boiler you have to worry about equipment and pipes freezing and breaking during an extended power outage in winter. Zoning is easier in radiant heating systems than in forced-air systems. Many HVAC contractors are more familiar with furnaces than boilers, so finding reliable maintenance and repairs may be easier with a forced-air system. At Carey Plumbing & Heating, Inc., we specialize in keeping our customers comfortable. Having your heating system serviced will improve its efficiency, reliability, and longevity. We won’t just inspect your boiler system, we actually clean the boiler and test the safety devices. • We specialize in steam boilers, hot water boilers, baseboard, and radiant heat. • We service all manufacturers. • We install a high performance air elimination system on all our boiler installations. • We perform load calculations to ensure that the boiler is sized correctly. • We install heating emitters from baseboard to radiant heating panels. • We will service and maintain your existing heating system. • We will troubleshoot and repair a problem heating system. • We will perform backflow prevention testing. In the State Of Michigan it is mandated that boilers be tested on a yearly basis. This testing ensures the safety of the system. On commercial boiler systems we will set you up for automatic CSD-1 boiler testing as mandated by the State of Michigan. At Carey Plumbing & Heating, Inc., we continue to service and install fuel oil heating systems as we have since 1939. Having your heating system serviced will improve the efficiency, reliability, and longevity of your equipment. • We will perform yearly maintenance on your fuel oil heating system. • We will troubleshoot and repair problem systems. • We can perform combustion analysis on your heating system. • We stock repair parts for your fuel oil heating system. Carey Plumbing & Heating is one of the only companies in the area that services fuel oil heating systems. It really is important to get these systems serviced on a regular basis in order to keep them running smoothly and safely. It is much better to get your system serviced yearly. It will be cleaner and will take much less time to service. Just saying. There are so many choices for Gas Log Fireplaces for your home. Do you have an old fireplace where you would like to install gas? Are you remodeling or adding on to your home and want to install a fireplace? Do you have an nice deck or porch area where a fireplace would make a lovely addition to make you space useable for a longer season? We can help you with that. Do you already have a gas log fireplace but it is not quite working the way it should? We can service your unit, whatever the issue may be. Do you need a new log set? Do you want to switch from Propane to Natural Gas? Our techs are here to help you choose a fireplace or to ensure your existing unit is working at peak performance. The purpose of preventative maintenance is to keep your HVAC system up and running all season long with no surprise breakdowns, while operating at top efficiency. Note: A failing HVAC system does more than cost a lot of money to repair; it can also endanger your family. For instance, if the furnace develops a crack in the heat exchanger, carbon monoxide gas can escape and poison the air you breathe. Also, electric HVAC systems can develop a short circuit, which is a serious fire hazard if ignored. Clearly, your family’s safety is very much a reason to schedule annual HVAC system maintenance. Every central heating and cooling system should be serviced by a heating and cooling professional twice yearly – at the beginning of cooling season and the beginning of heating season. Perform any necessary cleaning, including the heat exchanger and burner. Inspect the venting system and confirm that it is operating properly. Check for soot, leaks, rust, corroded electrical contacts and frayed wires. Check the system’s refrigerant level. If the outdoor unit’s refrigerant level is low, your service technician should check for leaks and repair the leak or replace the leaking component – not just add more refrigerant. Carey Plumbing & Heating, Inc. is your boiler service and installation specialists in the central Michigan and Great Lakes Bay region. We think pipes are a thing of beauty. Hot water heating has the benefits of being quiet and a more even heat than traditional forced air heat. Call us if you are interested in learning more.